There are a few sweet treats that just scream summer. S’mores and Strawberry Shortcake are just two that come to mind! D-Luxe Burger at Disney Springs is taking the sweet summertime treat of Strawberry Shortcake to the next level with a Strawberry Shortcake Milkshake! The Strawberry Shortcake Shake blends vanilla gelato with milk, toasted marshmallow, crushed graham crackers, and strawberry sauce. Then, the frozen treat is topped with whipped cream and a Maraschino cherry. The shake is just $7.50 plus tax. While at D-Luxe Burger in Disney Springs, make sure to try out some of their other delicious menu items. You can’t go wrong with the Classic Cheeseburger that starts with a signature blend beef patty topped with cheddar cheese, lettuce, tomato, grilled onions, and a pickle. They also have some great “Duos” that are meant to serve two guests and gives a choice of two burgers and an order of fries to share. Have you tried the Strawberry Shortcake Shake from D-Luxe Burger? Let us know in the comments below! 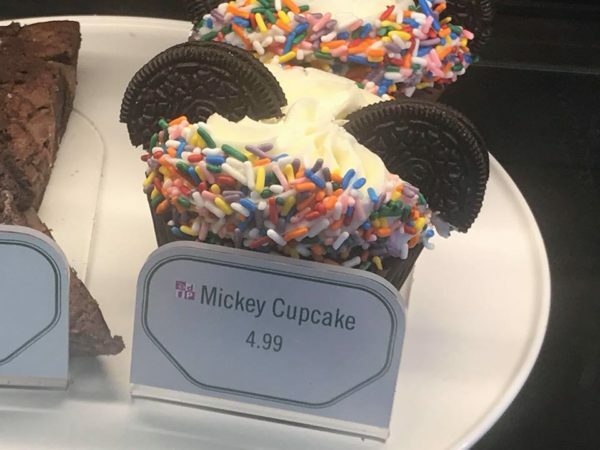 Rainbow Sprinkles and Oreo Cookies Make the Fountain View Mickey Cupcake an Adorable Treat!